Walking into my year as Miss Wisconsin’s Outstanding Teen, I had no idea what to expect. I was nervous, thrilled, curious, but most importantly I was passionate. I had passion inside me that I had never experienced before. 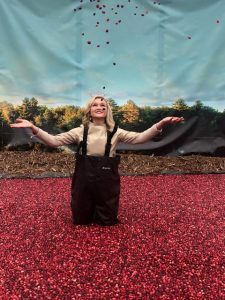 It was a passion that pushed me to reach for bigger and better things. I knew every girl that came before me used her title to bring her platform to the hearts and homes of the people in their community, and this new passion of mine wanted to do the exact same thing. Now as my year is slowly coming to end, I took some time to reflect on a few of the questions I had asked myself the night I was crowned, and I’d like to share with you all my answers that I’ve found this far into my year. What will be the most life changing during my year? I’ve always loved working with kids, and considering that CMNH is the national platform for the organization I knew my year would involve a lot of encounters with children. 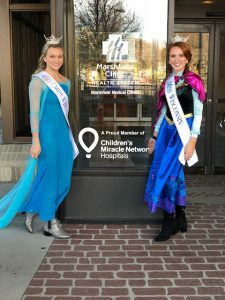 The first time that I had ever entered a CMN Hospital, aside from being in one as a patient, was this last Halloween with Tianna, our Miss Wisconsin. 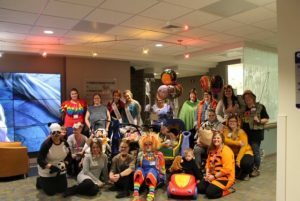 Tianna and I dressed up as Anna and Elsa (played by me), and traveled around the Marshfield Children’s Hospital, trick or treating with a few of the patients. It was something so small to the kids, but also something that brought a smile to their face, which then brought a smile to my face. I can recall almost every detail about this day, from the frozen album Tianna and I listened to on the way down, to the zoo costumes that each staff member dressed up in. After leaving the hospital I realized the true meaning behind the crown. The crown isn’t meant to be fancy or shinny. In my opinion it’s meant to make you feel like a disney princess full of courage and strength, which is why I never pass up the opportunity to ask a little girl if she wants to try it on. Will I be able to balance dance, school, and my title? The answer to this question is yes. Many of you may know that I absolutely love dancing, and school is a top priority for me. 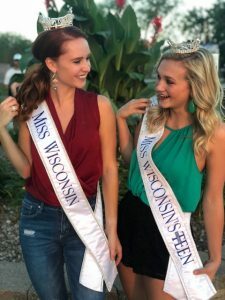 However, the title of Miss Wisconsin’s Outstanding Teen is ONCE IN A LIFETIME! When it comes to school, my teachers and principal have been nothing but supportive of me, and the same goes for my dance team. 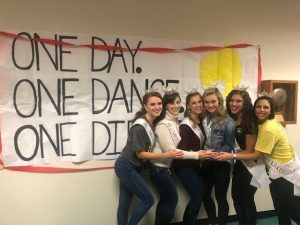 The night I was crowned some of my dance friends came out to watch the show, and a few of them even helped me when it came to practicing my routine for MAOTeen. I’m beyond grateful for the love and support that they have poured into me this far, and I could not be happier to have the dance family that I do. What types of appearances will I do? Dance Marathons, Festivals, Parades, local pageants, Hospital Visits, News interviews, and so much more! My favorite part about going to appearances, is that they don’t even feel like appearances. Every event that I have been to so far has been full of smiles, laughs, and lots and lots of pictures. Sidenote, if you don’t believe me then you should check out my instagram. How will this year change me? In so many ways! I’ve become more efficient with time management, more outgoing in social situations, and more confident in myself. I was always really shy growing up, and this title has taught exactly the reason why I never needed to be. I’ve learned that you can’t always make everyone happy, but you can always do things that make you happy. We all have our own special traits that make us unique. Instead of being afraid to show people how we are individual, we need to learn to embrace it. I think that the biggest take away I’ll have from this year is that lesson alone. That no matter where we are, or who we are around, we have to stay true to ourselves. Although I only answered a few questions, these are the ones I believe to have been the most crucial for me to understand. 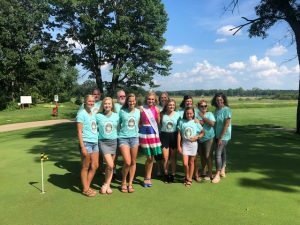 I’ve learned personal growth, the power of kindness, and the meaning behind the crown. My year may be over half way done, but what I’ve learned this far will never be forgotten. I appreciate every person whose path I’ve crossed, every appearance I have had the privilege to attend, and every child who has reminded me why I love what I do. I’ll be sure to keep you all updated on what’s to come next!